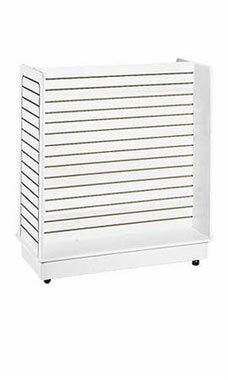 White Slatwall Gondola Unit - 24" x 48" x 54"
The display setting of the White Slatwall Gondola grabs the attention of customers and increases store appearance. The Slatwall Gondola has ample space and strength due to the depth of its sides and end panels. Take your product displays and layouts to the next level and impress customers with this new display merchandiser. The Slatwall Gondola is 24"W x 48"L x 54"H and outfitted with a 6"H base and casters that are included. They are in stock and available for immediate shipping! Added a new and modern look to our showroom at a minimum cost. Have been using Store Supply Warehouse for many years and all their products have been outstanding! Very please with ease of purchase and item purchased. I've been thinking about trying this gondola for a while now, instead of regular 4 way racks, and i really liked this product. The finish is high quality and the base came already put together so it literally took me 20 min to put it together and i am a woman! Now my clothing shows much better and neat and i can also change it into so many different layouts.